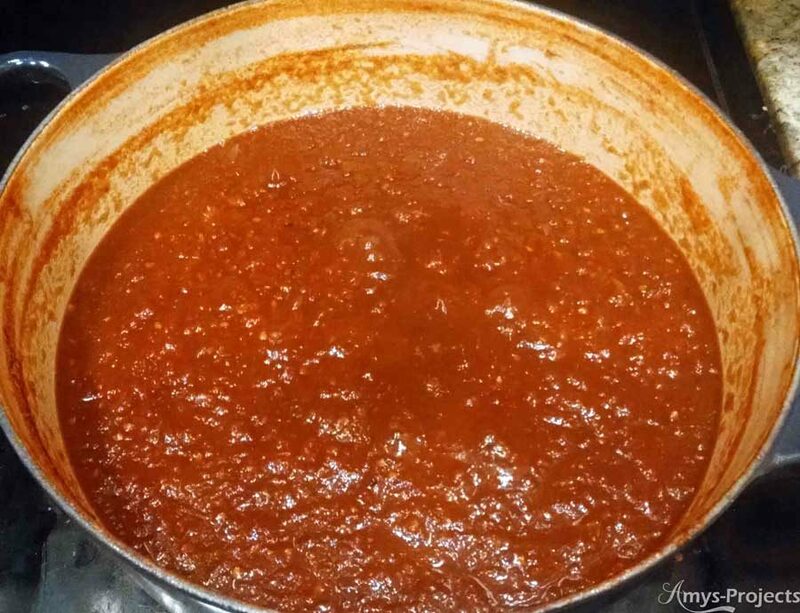 Oh man, fresh homemade chili sauce is sooo much better in recipes than store bought. 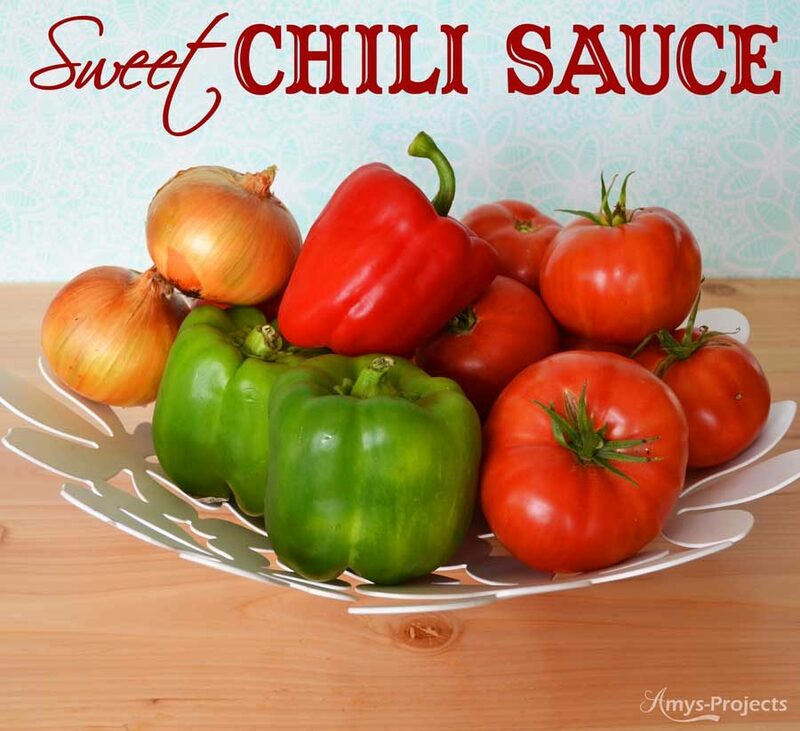 This recipe is a sweet chili sauce, not hot. We absolutely love it on top of our meatloaf and in baked beans, delicious. Grind up the peppers and onions. 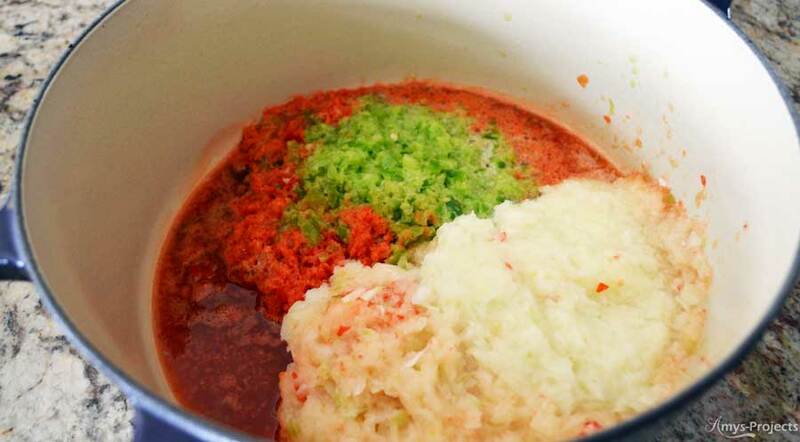 This can be easily done in a food processor or pulse it in a blender. Dice up the tomatoes and add them to the pepper and onions. Add the vinegar, salt, brown and white sugars and bring to a boil then turn to simmer, stirring occasionally. 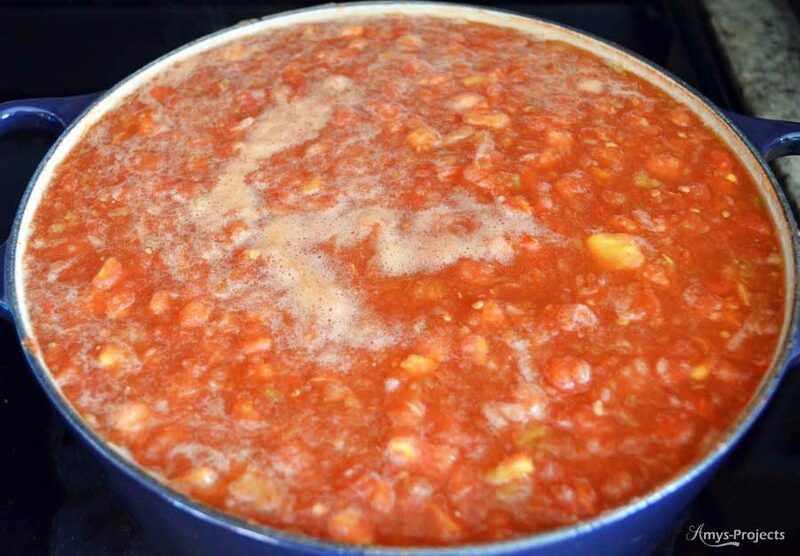 Let the sauce simmer for about 4 hours, or until it reduces 1/3 to 1/2 depending on how you like your sauce. Stir in the cinnamon, allspice, cloves and ginger. If you want, you can freeze this in freezer bags. This sauce is easily canned. 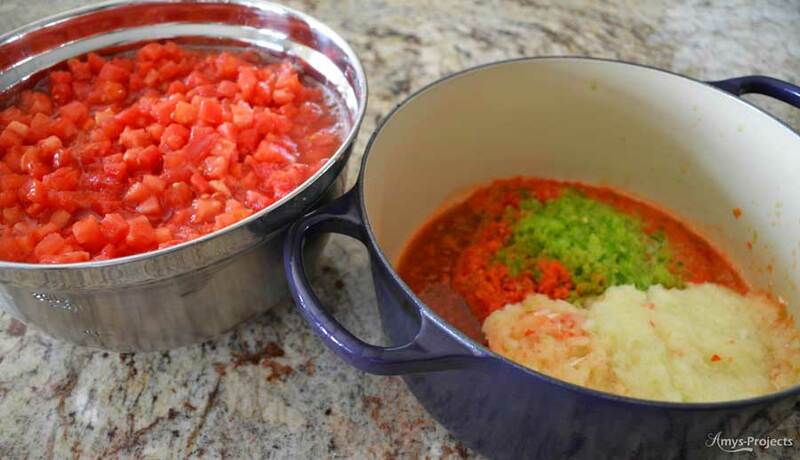 Prepare 5-6 pint jars by washing and sterilizing the jars. Start heating a large pot of water for a water bath. 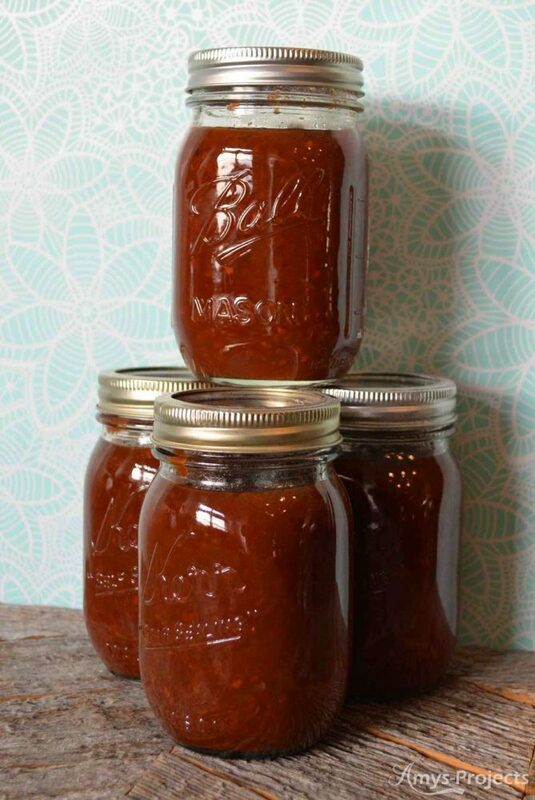 Fill the jars with chili sauce, leaving 1/2″ head space. Clean the jar rim, top with a new lid. Snugly place a clean band on the lid. Once the water bath is boiling, place the jars in the water for 30 minutes, (I’m at 4,000 ft). Make sure the water is at least 1″ above the jar tops. Once the time is up, pull the jars out and set aside for cooling. The lids should ‘pop’ or seal within a few hours. If any of the lids do not seal, pull the lid off and clean the rim and reprocess or place in the fridge to use. Seeing I don’t have a food grinder can I use a food mill that I use when I make tomatoes juice? Finally, a recipe that tastes very similar to my late grandma’s. It’s amazing! Thanks for the missing link to my childhood memories!!! Do you peel the tomatoes before you Dice them? Thank you!!!! I have been searching for a recipes like this. This is what my mother used to make and can every year. I don’t know if it’s exact but close enough. Most of the ingredients look very familiar. Bell pepper, sugar, tomatoes, cinnamon etc. When she died my brother took all her cook books and recipes and I don’t have access to them. I am in tears that I found this recipe and can’t wait to make it!!!! !